Madrid is also synonymous with culture. The Spanish capital has some of the world’s best art museums and in this post we tell you about fantastic exhibitions you can see in the city in the upcoming months. They will not let you down. This exhibition shows 73 of the close to 500 sketches that Rubens painted during his artistic career. Drawings, pictures and paintings from the artist complete this cultural showcase. Rubens always began his creative process with a sketch, which he then painted in oil, hence his importance as one of the most important sketch creators in European art. You can see it in the Prado Museum until August 5, 2018. At the Thyssen-Bornemisza Museum in Madrid you can discover, for the first time, the relationship between the sensational Impressionist painter Claude Monet and his mentor Eugène Boudin. Boudin, one of the first French landscape artists to paint outdoors, met Monet in Le Havre, France. Impressed by his talent at such a young age, he convinced Monet to visit him in Normandy and paint landscapes. Thanks to this exhibition, you can discover the origins of the Impressionist movement through approximately 100 works. The exhibition will be open from June 26 until September 30, 2018. This exhibition at the Telefónica Foundation gathers images from 46 photographers of different generations. All of them have two things in common: one, the world of play is the main feature; and two, they have all worked for the Magnum photography agency. This exhibition shows the most recreational and casual side of photographers from this prestigious agency. If you love photography, you have to see it. You still have time, since it is open until September 16, 2018. The Reina Sofía Museum is hosting an exhibition which brings visitors closer to the Russian avant-garde art movement Dada (or Dadaism). In this exhibition, you can discover up to 250 works by Russian artists which comprise paintings, collages and even illustrations. Dada is famous for breaking all moulds and conventional formalities. You can visit it from June 6 until October 22, 2018. Our last recommendation is aimed especially at Disney fans. 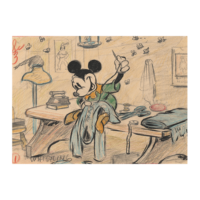 Walt Disney was always interested in drawings and his animation studio was born from this passion. Myths, fables and legends have been the origin of Disney films and thanks to this exhibition we can discover the process followed to create classic films such as The Little Mermaid or Sleeping Beauty. You can visit it from July 17 until November 11, 2018; at CaixaForum Madrid. There is plenty to choose from, no matter what your tastes are. If you would like to visit one of them and you have still not sorted out accommodation in Madrid, don’t miss out on our fantastic offers.